This is a great little deal. 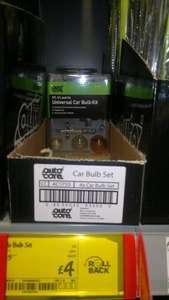 For example, the H7 headlamp bulb on its own sells for £10 in Halfords. cant really compare to halfords as everything in there is ridiculously overpriced. not a bad price though. cant really compare to halfords as everything in there is ridiculously … cant really compare to halfords as everything in there is ridiculously overpriced.not a bad price though. Fair comment and thanks - just using the Halfords example for illustration purposes.